Welcome to the introduction to my self calming, deep relaxation and sleep CD. 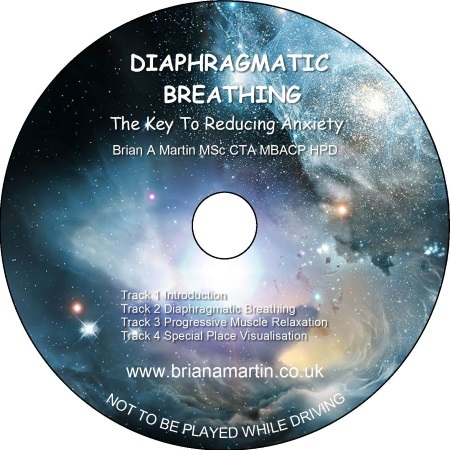 This CD is an instructional CD which teaches how to use a breathing technique called 'Diaphragmatic Breathing' to calm yourself down in any situation where that would be helpful. It is not primarily a relaxation or sleep album although most people say that they experience it as such. There are three tracks following the introduction track. Track Two teaches the deeply relaxing way of breathing called 'Diaphragmatic Breathing'. Diaphragmatic breathing is a way of feeling calm, whenever, or wherever, that would be helpful. The beauty about diaphragmatic breathing is that the more you practice it, the more deeply calming it gets. You can use Diaphragmatic Breathing anytime any place when you are feeling tense or anxious. All you will need to do to feel calmer is change your breathing to Diaphragmatic Breathing for a couple of minutes. Diaphragmatic Breathing is also a vital element in successful Anger Management. It will help you to calm down whenever you feel anger or frustration rising inside you. Track three is a deep relaxation technique called Progressive Muscle Relaxation. You will find Progressive Muscle Relaxation very deeply relaxing. You'll also find that it increases the calming power of your diaphragmatic breathing and your ability to feel calmer in any situation. The progressive muscle relaxation track is also ideal as a sleep track. You can listen to it last thing before you go to bed, or in the night if you wake up and have difficulty in getting back to sleep. Track four is called, 'Special Place'. It's a guided visualisation and deep relaxation track which will enable you to visit in your mind, a special place of your choosing, a place where you are able to feel peaceful and safe. You can choose any place past or present, real or imaginary, maybe a place you have yet to visit. Usually my clients are amazed by how real the visualisation experience is. One client visited the place of her childhood. Afterwards, when she told me where she had been, I said 'sounds beautiful, when did you last go back there? Her answer? 'Just!' Your special place may be a place you have seen in a film, or read about in a book. One of my clients visited New Zealand, which was somewhere he had always wanted to go. Another made a trip into outer space and drifted silently amongst the stars. Another client imagined herself in an apartment inside a glass mountain where she felt completely safe, she could see everything in all directions and no-one could get in unless she let them. Special place is also an excellent sleep track.